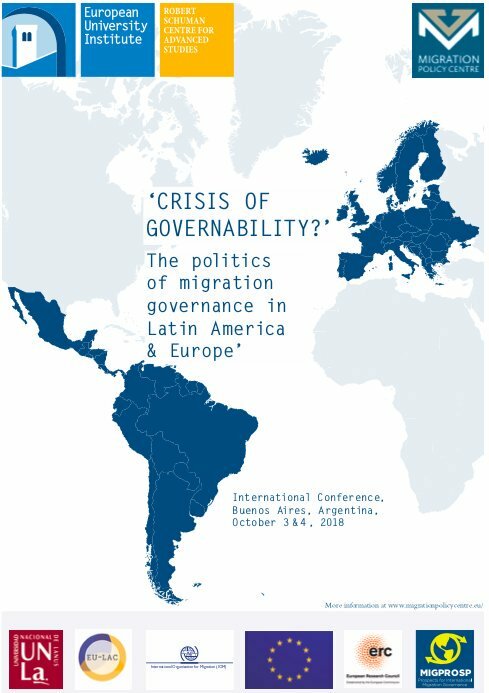 This international conference seeks to analyse the state of governability of immigration in Europe and Latin America by examining the varied and complex components of migration governance politics. A comparative angle between the two regions will provide deeper insights about the dynamics of migration governance and its underlying politics. The conference will gather academics, experts and policy makers from both regions to discuss this pressing issue. The objective is to foster a research agenda that goes beyond macro trends of migration policies, creating a space of dialogue and exchange between the two regions. The conference is supported by the EU-LAC foundation and jointly organised by the Migration Policy Centre, the Regional Office of the IOM in South America, and the University of Lanus within the framework of the ERC project ‘Prospects for International Migration Governance (MIGPROSP)’. Speakers in the conference have been selected following a call for papers that was closed on 31 May 2018 – download the full Call for Papers here (English) and here (Español). Registration to attend the conference is free of charge. The conference will be held in English and Spanish.